I am sure there will be a day in the future when we have to have a discussion with Perry about the proper use of toilet paper...and that it is not for dragging all over the house, or littering the yard of classmate's houses. This point might be harder to make considering we will be actively encouraging him to throw it in trees every fall on Auburn's campus. He might only be 4 months old, but he has already rolled a tree...along with about 100K other people. 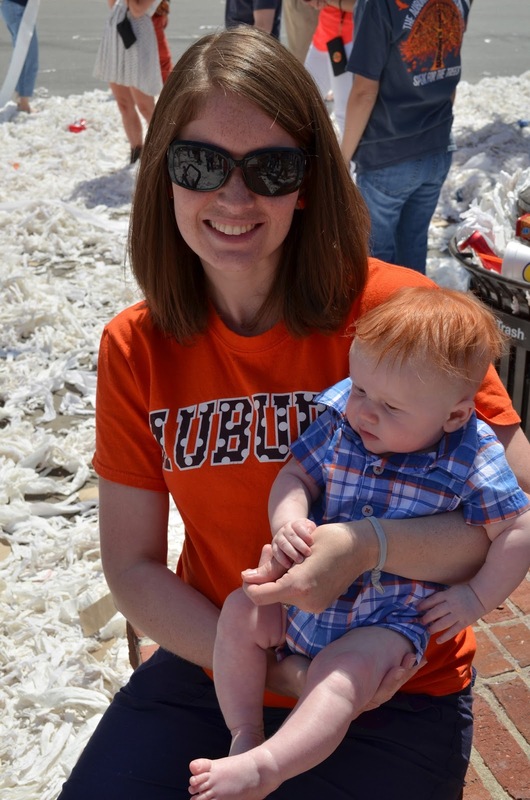 The number of people (and rolls of toilet paper) that gathered at Toomers Corner for the final roll was excitedly overwhelming. 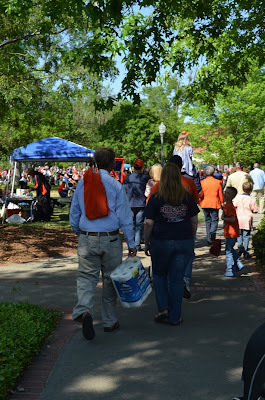 We actually couldn't get very close to the trees right after the A-day game. We got within maybe a hundred feet and the crowd came to a stand still. 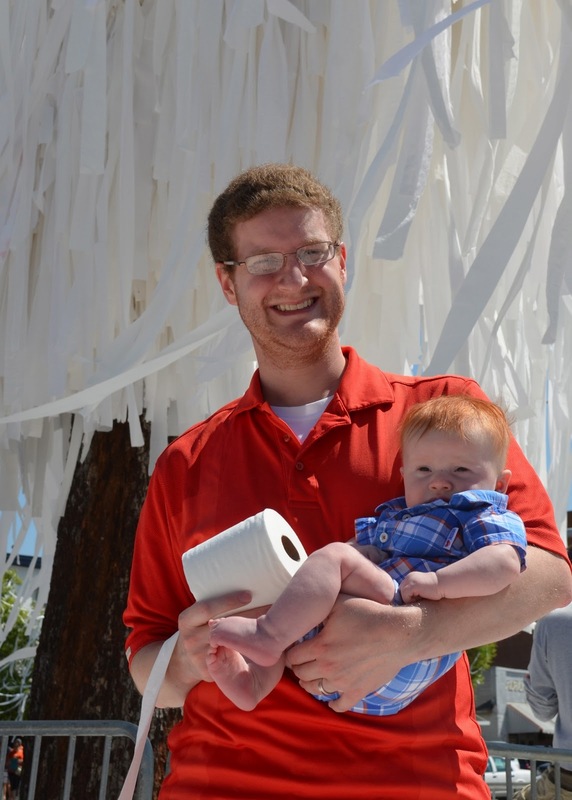 So we took a couple pictures threw a roll of toilet paper into the crowd and backed off. At Auburn Art (one of our favorite Auburn stores) they had this really awesome (and very large) picture of a tree on the wall and were having everyone put their thumbprints on it as the leaves. Perry's little 3.5 month thumbprint will forever be captured on this picture. He thought it was really fun! We hung out on Samford lawn for a while with the Eckleys and Aunt Lisa (pictures for another post) and then went back to Andrew's grandmother's (aka Gigi) house for dinner. It was nice to get away from the craziness for the evening. 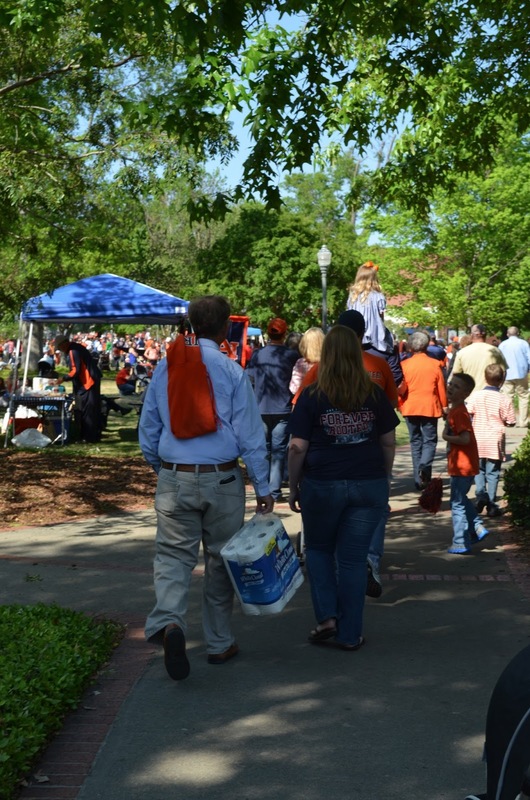 We stayed in a hotel in Auburn Saturday night and went back into downtown Auburn Sunday morning for one last visit with the oak trees. It was so much nicer on Sunday. Way less people and we were able to get all the way up to the trees to touch them and take pictures. 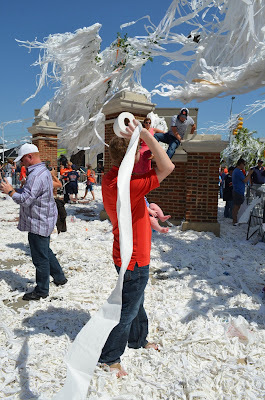 We tossed the rest of our toilet paper and said our goodbyes. By the time Perry is old enough to remember, there will be new Toomers oak trees and the tradition will continue, but I am so glad Perry was able to see the originals.